The Cabaret of Plants: Botany and the Imagination. 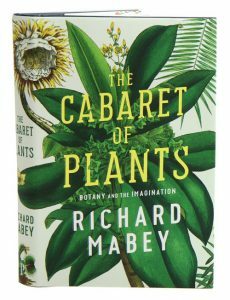 In Richard Mabey’s characteristically lyrical and informative tone, The Cabaret of Plants explores plant species which have challenged our imaginations, awoken that cliched but real human emotion of wonder, and upturned our ideas about history, science, beauty and belief. Picked from every walk of life, they encompass crops, weeds, medicines, religious gathering-places and a water lily named after a queen. Beginning with pagan cults and creation myths, the cultural significance of plants has burst upwards, sprouting into forms as diverse as the panacea (the cure-all plant ginseng, a single root of which can cost up to $10,000), Newton’s apple, the African ‘vegetable elephant’ or boabab, whose swollen trunks store thousands of litres of water – and the mystical, night-flowering Amazonian cactus, the moonflower. From Ice Age artists, to the Romantic poets, via colonialism and the nineteenth century botanical mania of empire, Mabey concludes his magnum opus with the latest revelations of possible ‘plant intelligence’ in this extraordinary collection of encounters between plants and people. 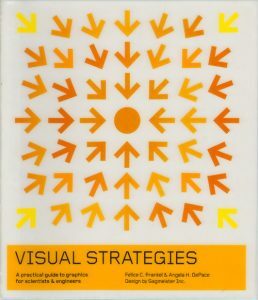 Visual strategies: a practical guide to graphics for scientists and engineers. Artist/Author: Frankel, Felice C. and Angela H. DePace. This book provides scientists and engineers who communicate research results with an indispensable tool. To assist researchers who have little or no previous design training, this guide sets out clear frameworks and offers abundant examples for creating effective visual graphics for use in multiple contexts, including journal submissions, grant proposals, conference posters, or presentations. Visual communicator Felice Frankel and systems biologist Angela DePace, along with experts in various fields, demonstrate how small changes can vastly improve the success of a graphic image. They dissect individual graphics, show why some work while others don’t, and suggest specific improvements. 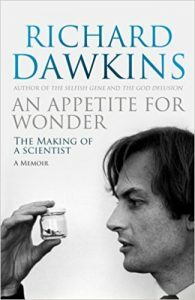 Born to parents who were enthusiastic naturalists, and linked through his wider family to a clutch of accomplished scientists, Richard Dawkins was bound to have biology in his genes. But what were the influences that shaped his life and intellectual development? And who inspired him to become the pioneering scientist and public thinker now famous (and infamous to some) around the world? In An Appetite for Wonder we join him on a personal journey back to an enchanting childhood in colonial Africa. There the exotic natural world was his constant companion. Boarding school in England aged 8, and later, public school at Oundle introduce him, and the reader, to strange rules and eccentric school masters vividly described with both humorous affection and some reservation. An initial fervent attachment to Church of England religion soon gives way to disaffection and, later, teenage rebellion. Early signs of a preference for music, poetry and reading over practical matters become apparent as he recalls the opportunities that entered his small world. Oxford, however, is the catalyst to his life. Vigorous debate in the dynamic Zoology Department unleashes his innate intellectual curiosity; and inspirational mentors together with his own creative thinking ignite the spark that results in his radical and new vision of Darwinism, The Selfish Gene. From innocent child to charismatic world-famous scientist, Richard Dawkins paints a colourful, richly-textured canvas of his early life. Honest self-reflection and witty anecdote are interspersed with touching reminiscences of his best-loved family and friends, literature, poetry and songs. We are finally able to understand the private influences that shaped the public man who more than anyone else in his generation explained our own origins. Artist/Author: Meek, Paul and Peter Fleming. Camera trapping in wildlife management and research is a growing global phenomenon. The technology is advancing very quickly, providing unique opportunities for collecting new biological knowledge. This text provides a benchmark of the international developments and uses of camera traps for monitoring wildlife for research and management. 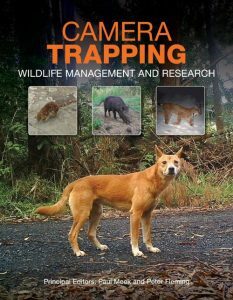 Four major themes are presented: case studies demonstrating camera trapping for monitoring; the constraints and pitfalls of camera technologies; design standards and protocols for camera trapping surveys; and the identification, management and analyses of the myriad images that derive from camera trapping studies. 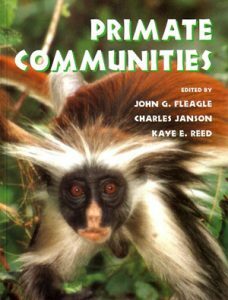 The final chapter provides future directions for research using camera traps. 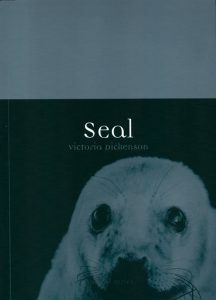 In addition, remarkable photographs are included, showing interesting, enlightening and entertaining images of animals ‘doing their thing’. Artist/Author: Rothman, Julia and John Niekrasz. See the world in a new way! 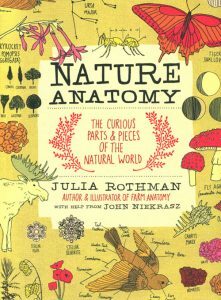 Acclaimed illustrator Julia Rothman celebrates the diverse curiosities and beauty of the natural world in this exciting new volume. With whimsical illustrations, every page is an extraordinary look at all kinds of subjects, from mineral formation and the inside of a volcano to monarch butterfly migration, the ecosystem of a rotting log, the parts of a bird, the anatomy of a jellyfish, and much more. 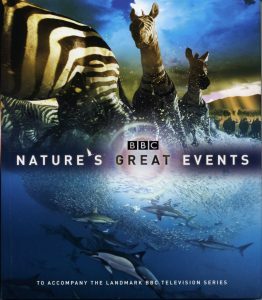 With a definite focus on plants and animals found in North America, this book provides a charming introduction to the natural world. 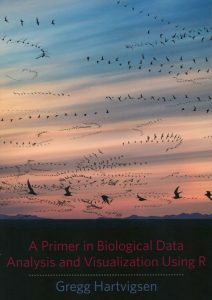 Drawing on Gregg Hartvigsen’s extensive experience teaching biology, this text is an engaging, practical, and lab-oriented introduction to R for students in the life sciences. Underscoring the importance of R and RStudio to the organization, computation, and visualization of biological statistics and data, Hartvigsen guides readers through the processes of entering data into R, working with data in R, and using R to express data in histograms, boxplots, barplots, scatterplots, before/after line plots, pie charts, and graphs. He covers data normality, outliers, and nonnormal data and examines frequently used statistical tests with one value and one sample; paired samples; more than two samples across a single factor; correlation; and linear regression. The volume also includes a section on advanced procedures and a final chapter on possible extensions into programming, featuring a discussion of algorithms, the art of looping, and combining programming and output. Shark’s paintbrush: biomimicry and how nature is inspiring innovation. Today an interdisciplinary and international group of scientists, inventors, and engineers is turning to nature to innovate and find elegant solutions to human problems. The principle driving this transformation is called biomimicry, and Harman shares a wide range of examples of how we’re borrowing from natural models to invent profitable, green solutions to pressing industrial challenges. 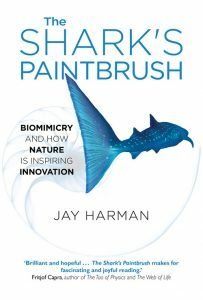 Aimed at a business audience, aspiring entrepreneurs, environmentalists, and general science readers, The Shark’s Paintbrush reflects a force of change in the new global economy that does more than simply gratify human industrial ambition; it teaches us how to live in harmony with nature and opens bright opportunities for a better future. Among the many fascinating topics Jay explores: what the human heart and dust devils have in common, and how this parallel structure can lead to better technologies in medicine; how studying seaweed can lead to resistance-free antibiotics; how the noxious-smelling durian fruit can offer ideas for helping humans live on Mars; how a single whale affords us a vast library of design expertise and information that can revolutionize industries as diverse as medical, aerospace, and emergency pollution response following oil spills and catastrophic tsunamis; how the blowfly maggot could lead to breakthroughs in materials science, helping to lower production costs and manufacture higher-efficiency substances; and, how the tiny scales making up the skin of sharks are being replicated on boats and airplanes to reduce drag and increase fuel efficiency. 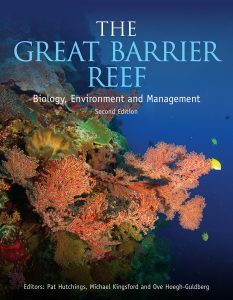 Also available in hardcover [stock id 35654]. Artist/Author: Bejan, Adrian and J. Peder Zane. 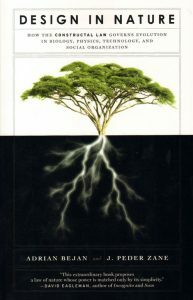 In this groundbreaking book, Bejan takes recurring patterns in nature, trees, tributaries, air passages, neural networks, and lightning bolts, and reveals how a single principle of physics, the constructal law, accounts for the evolution of these and many other designs in our world. Everything, from biological life to inanimate systems, generates shape and structure and evolves in a sequence of ever-improving designs in order to facilitate flow. River basins, cardiovascular systems, and bolts of lightning are very efficient flow systems to move a current, of water, blood, or electricity. Likewise, the more complex architecture of animals evolve to cover greater distance per unit of useful energy, or increase their flow across the land. Such designs also appear in human organizations, like the hierarchical “flowcharts” or reporting structures in corporations and political bodies. All are governed by the same principle, known as the constructal law, and configure and reconfigure themselves over time to flow more efficiently.